Immediately following the November 29, 2012 pursuit and use of deadly force incident, the City of Cleveland convened a Critical Incident Review Committee (CIRC) to conduct separate administrative reviews of the pursuit and use of deadly force to determine if any Police Officers were in violation of departmental policies. The administrative review of the incident was divided into two parts: the pursuit and the use of force. The CIRC completed their investigation into the pursuit in April of 2013. The results of that investigation and subsequent disciplinary findings can be viewed here. The investigation into the use of force incident was forwarded to the Office of the Cuyahoga County Prosecutor for review and determination of possible criminal charges. The County Prosecutor indicted one officer and completed criminal proceedings in May of 2015. Following the Prosecutor’s proceedings, the City immediately re-convened the CIRC to conduct an administrative review of the same use of force incident for determination of potential violations of Cleveland Police rules and procedures in June of 2015. 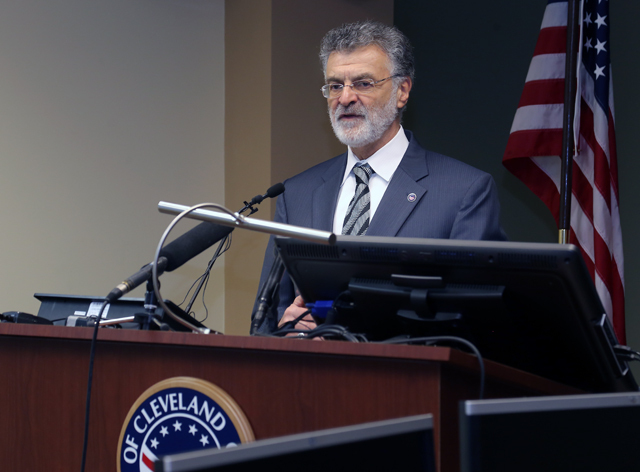 Today, the City of Cleveland presented the CIRC’s findings and subsequent disciplinary actions from the use of force investigation to the public. “We said from the beginning that this process would be fair and due process will be at its core,” said Mayor Frank G. Jackson. The CIRC committee reviewed all available records and evidence from this incident and forwarded their results and recommendations to the Director of Public Safety, Michael McGrath. In the spirit of transparency, the committee’s findings were made public in a presentation and press conference held by the Division of Police. View that presentation here. After reviewing the findings of the CIRC, the Director of Public Safety imposed the following disciplinary action: six officer terminations and six officer suspensions ranging from 21-30 days with no pay. A 13th Police Office has since retired in 2015. View the disciplinary letters issued here. All administrative disciplinary reviews of the November 29, 2012 pursuit and use of force matter are now complete. The review process has been thorough and the results have been fair. Where policy and rule violations were found, officers were held accountable. The Division of Police and the Office of the Mayor applied due process, at its core, throughout the duration of this administrative review. It is the City of Cleveland’s sincere hope that community and general public at large will recognize that everyone in this process had a fair representation and that due-process was served.